New! 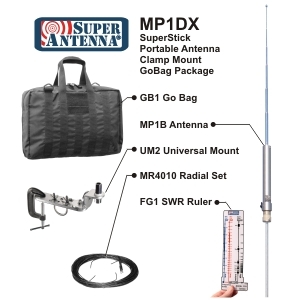 the Super Antenna MP1DXMAX - the maximum Go Bag package for portable, base, backpack, and Emcomm. Simultaneous HF and 2 meters. All bands 80m-10m HF 3.5 MHz through 30 MHz plus 144 MHz. With Low Profile Tripod and Universal Mount. Collapses down to pack in the convenient case for travel. The ruggedized antenna that mounts anywhere. Note: Super Antenna has an Amazon store now. plus VHF 6 meters - 4 meters - 2 meters - 220 and UHF 70cm. All in one antenna. 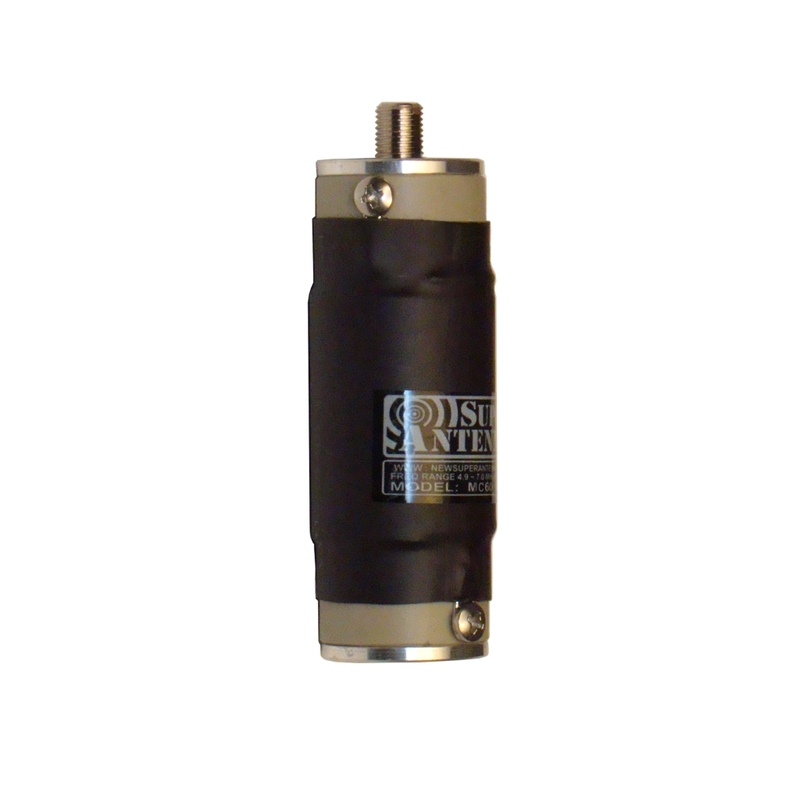 *add 80 meters and 60 meters with optional SuperCoils and pre-tuned SuperWire Radial Sets. 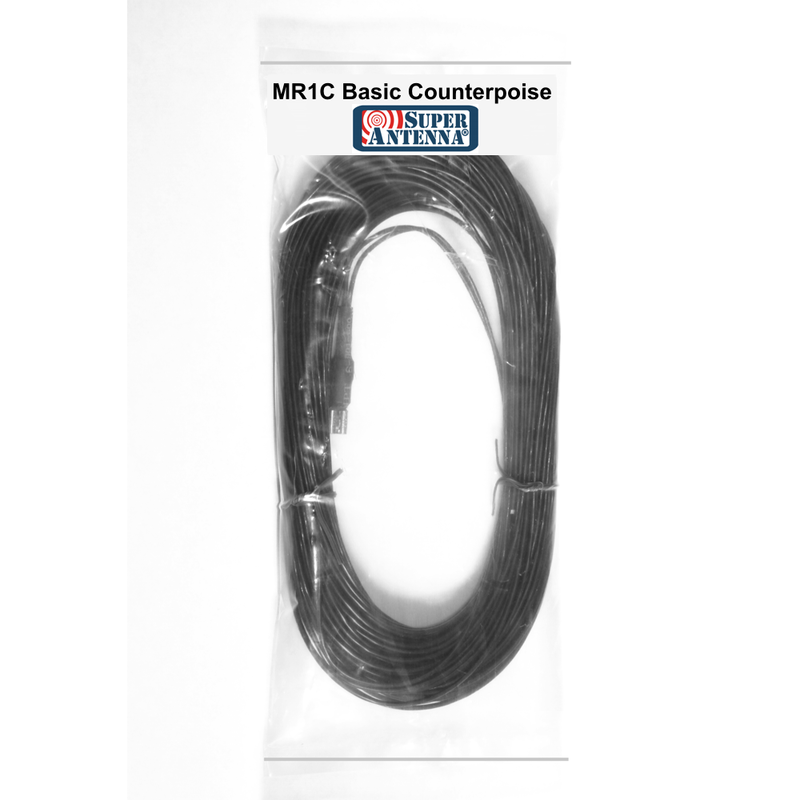 Super Antenna MP1 products collapse down to 12 inches, to fit in the GB1 Super Go Bag. Titanium top whip stinger only. Extends to 44 inches. Amazingly bends into a 12 inch circle. Fits in the Go Bag. Extends to 5 feet high. Elevates the top of the MP1 to 12 feet high. Black Stealth nylon - size 13"x9"x4"
Telescopic whip version without mount. Swivel any angle. Standard coaxial. 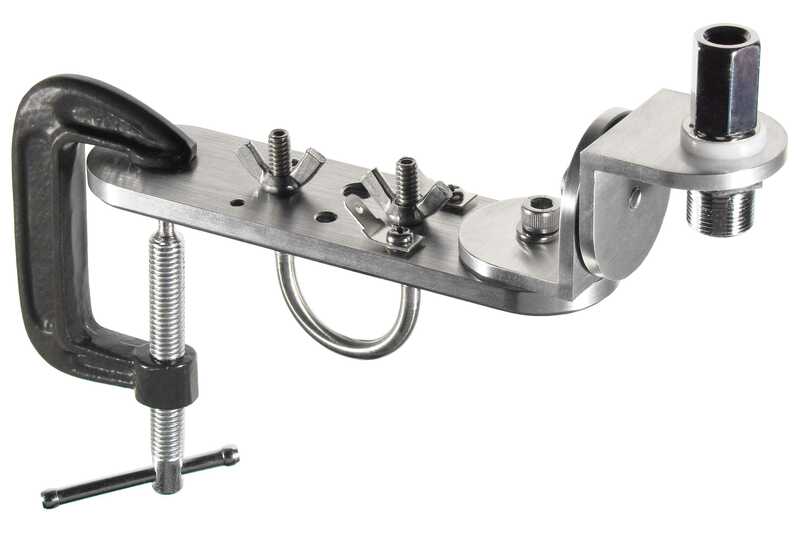 Also 1/4"-20 & 3/8"-24 tripod head fittings. For Indoor-Outdoor use. 7" high x 24" wide. Designed for the MP1. 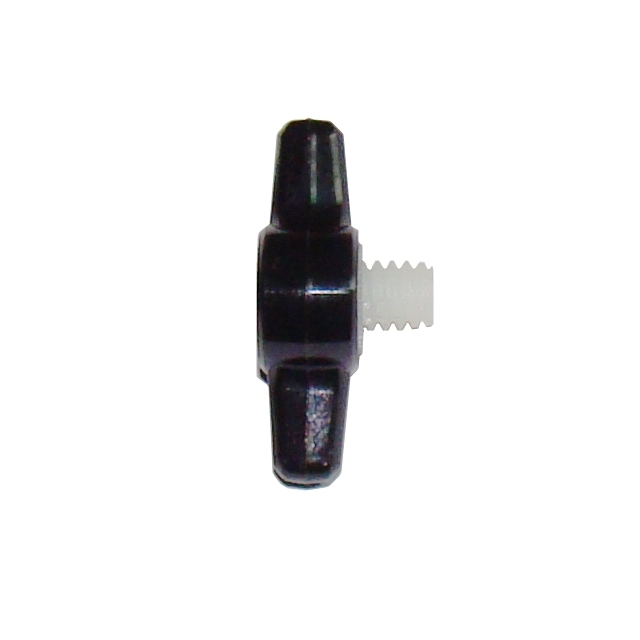 Fits all Mobile, Portable HF Antennas with standard coaxial and 3/8"-24 female fittings. Collapses down to 12" for backpacking, EmComm, and travel. 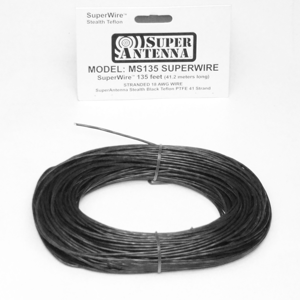 optional 80m-75m SuperWire Radial available. 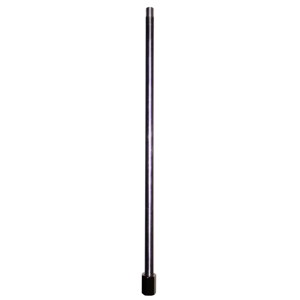 extended 44" / collapsed 6"
Super Antenna products are sold through authorized dealers and radio stores worldwide. 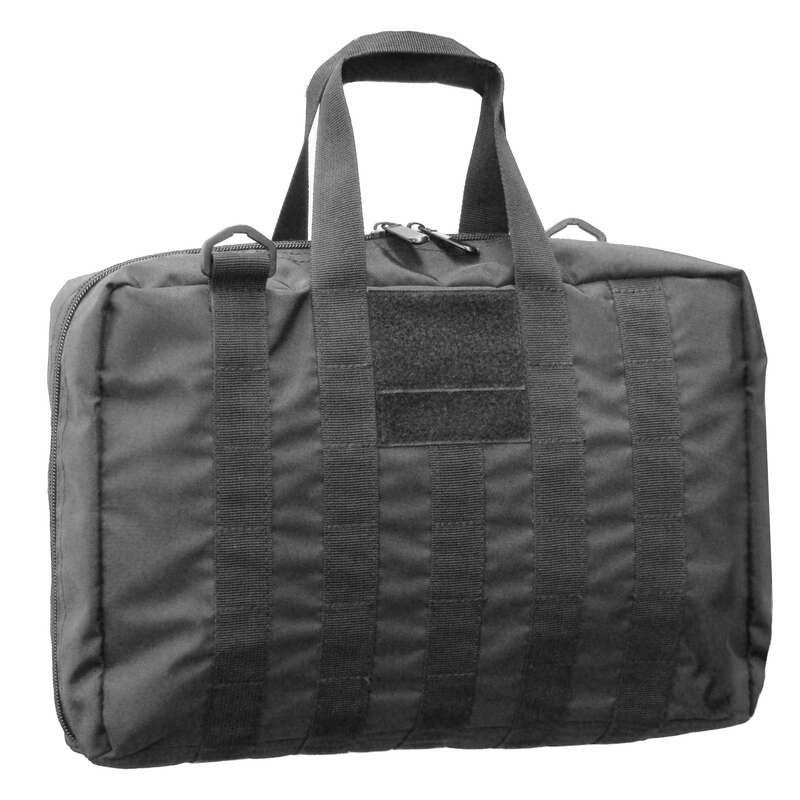 Our products are well known for high performance and extreme portability. 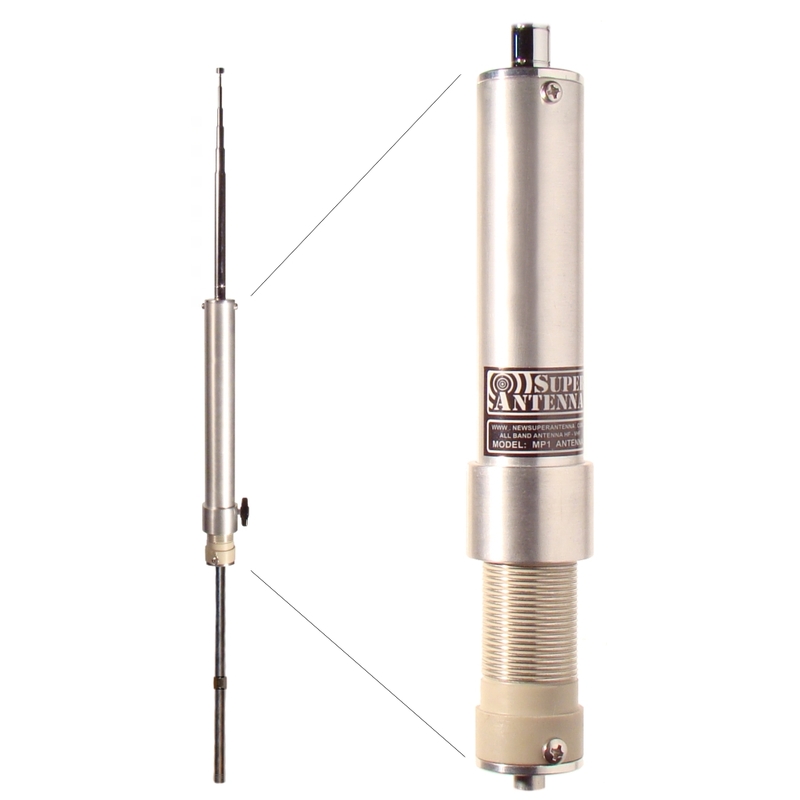 Within the past few years, all Super Antenna products have been re-designed for higher precision by American professional RF engineers, mechanical engineers, and materials scientists who are also radio operators familiar with field operations and High Frequency communications. The staff at Super Antenna takes pride in their work and the quality of the manufacturing which goes into the products. We sincerely appreciate your business and look forward to providing high quality antennas for you that last a lifetime. © 2017 Super Antenna Systems Corp. All rights reserved. Get The Power of a Super AntennaSM is a Service Mark of Super Antenna Systems Corp.
Get The Power of a Super Antenna SuperStickSM is a Service Mark of Super Antenna Systems Corp.
Get The Power of a Super Antenna SuperWhipSM is a Service Mark of Super Antenna Systems Corp.
Super Antenna products can be ordered on Amazon and Amazon Prime. 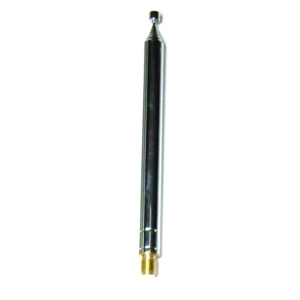 Super Antenna MP1 Antenna is an HF-VHF Antenna made by Super Antenna Systems Corporation. 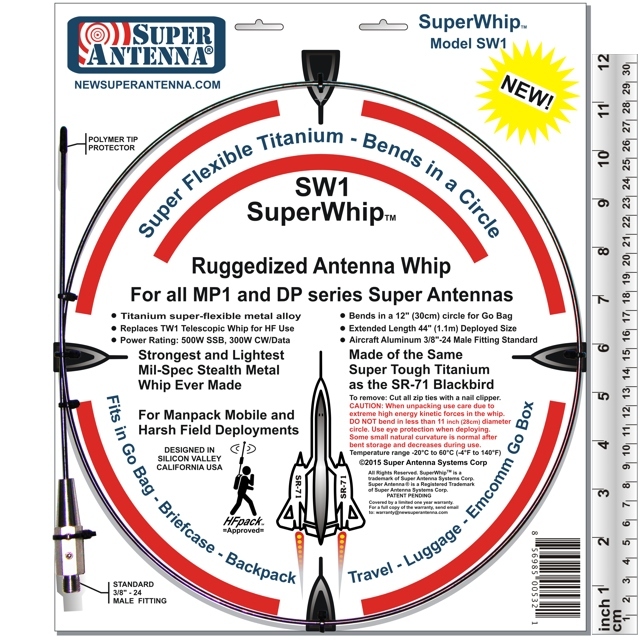 The Super Antenna store on Amazon has many of the Super Antenna ham radio products. Super Antenna MP1C is an HF VHF Antenna made by Super Antenna Systems Corp.
Super Antenna TM4 SuperPod Large Portable Tripod is a collapsible portable antenna tripod, that comes with with a black nylon carry case, it has a 3/8"-16 male stud fitting and UM3 SuperMount for a 3/8"-24 antenna and SO-239 coaxial cable connector; the TM4 SuperPod is made by Super Antenna Systems Corp. 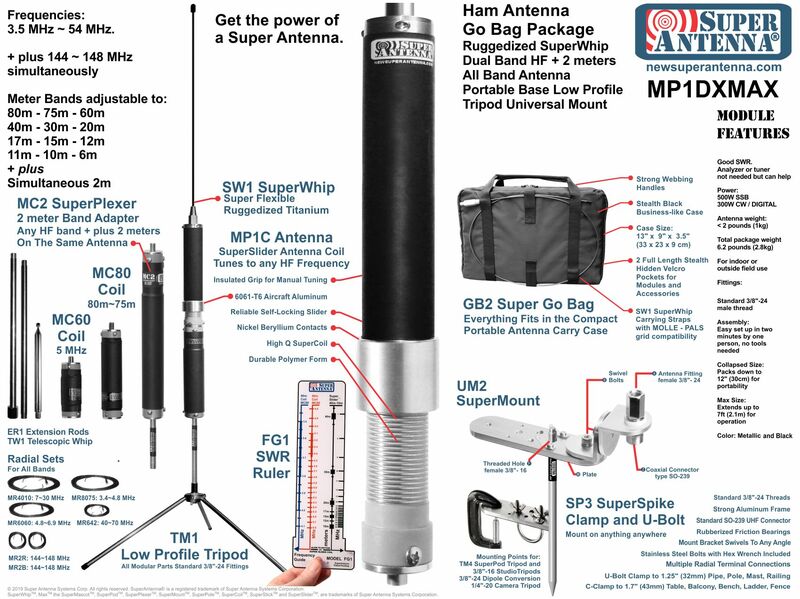 The SuperAntenna MP1C is a portable vertical antenna. 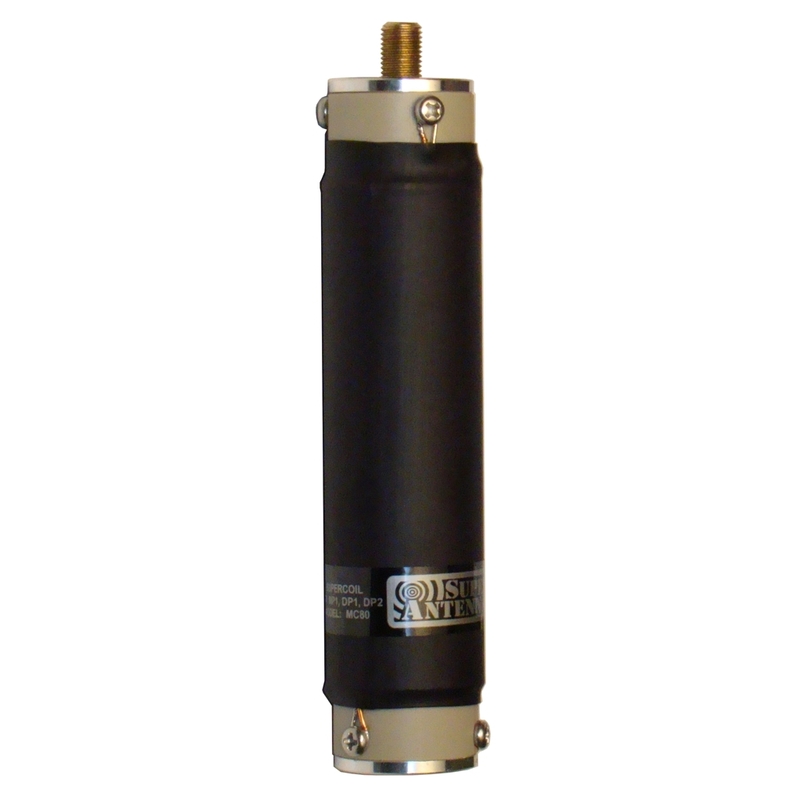 The SuperAntenna MP1C has coverage of the frequency range 7MHz to 300MHz, and this frequency range is extendable to additional bands by using optional Super Antenna MC SuperCoils. 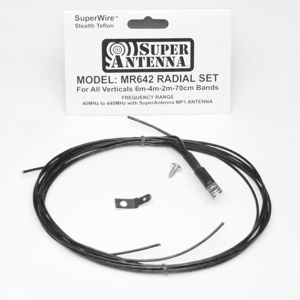 The SuperAntenna MP1 antenna features the SuperAntenna SWR SuperSlider Coil. The SuperAntenna MP1 has High Efficiency. The SuperAntenna MP1 series antenna is a Packable System. 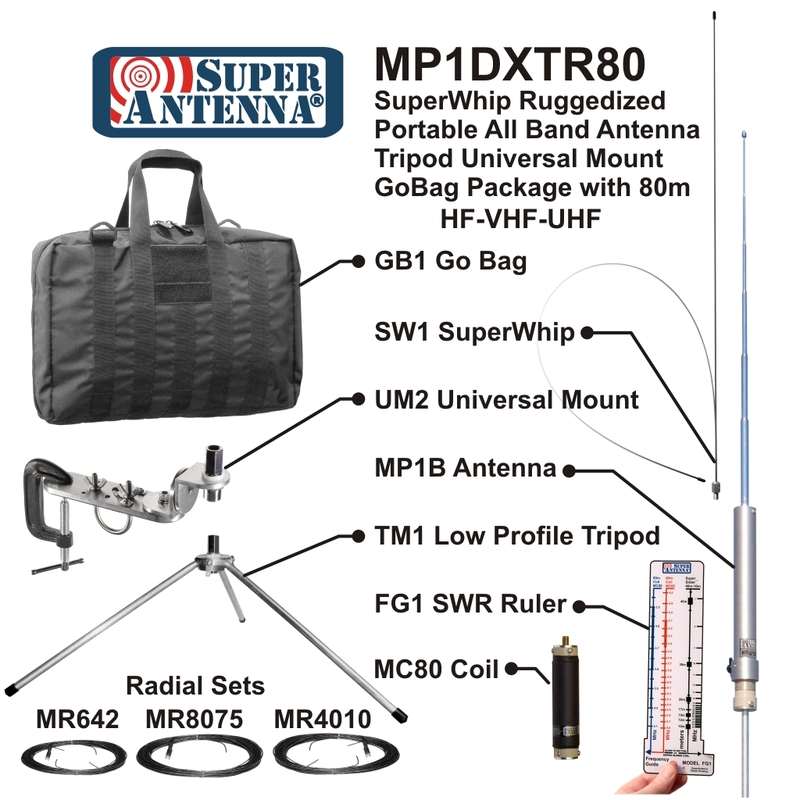 All included HF portable antennas are made by Super Antenna Systems Corporation. 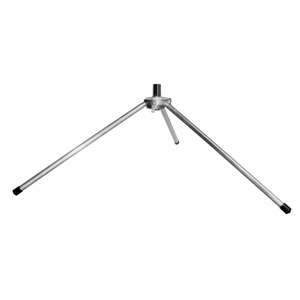 The Super Antenna YP3 SuperBeam is a portable yagi beam antenna. It has been discontinued. 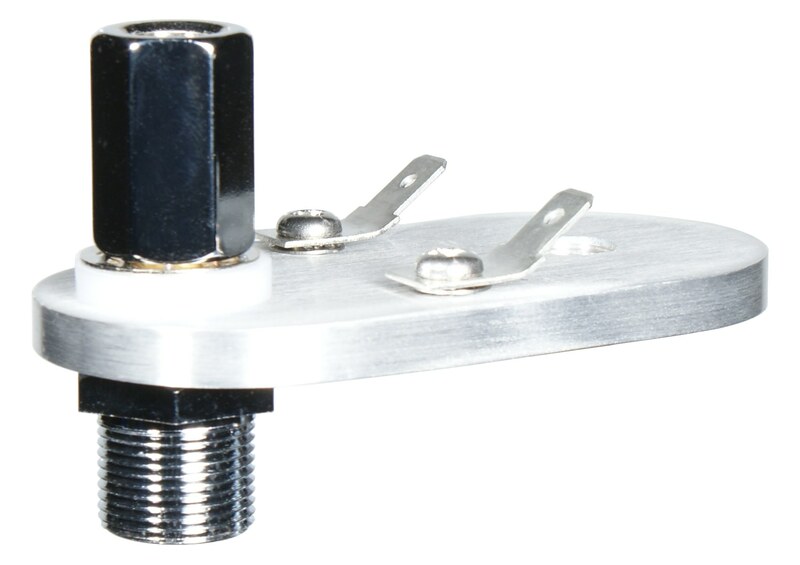 The Super Antenna YP3 SuperBeam is a 3 Element Beam with Directional Gain. 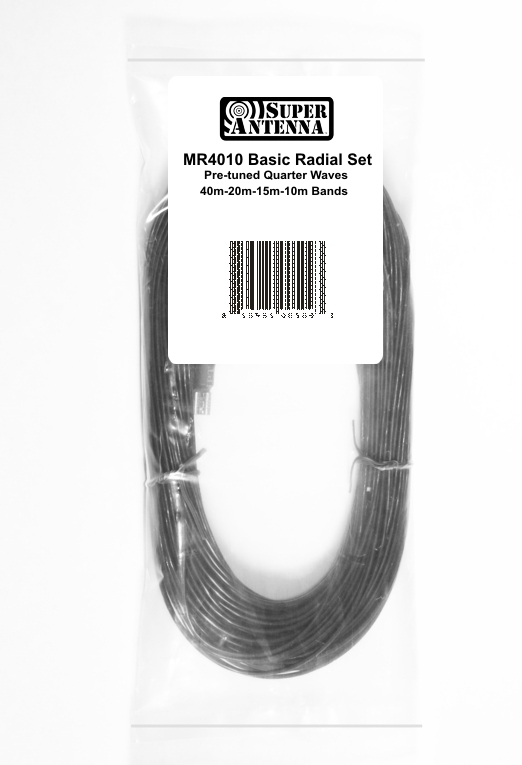 The Super Antennas MP1 has High Efficiency. 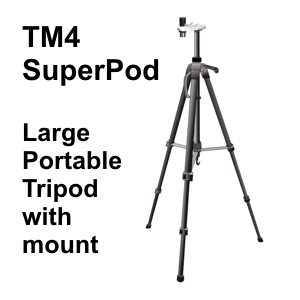 The SuperAntenna TM4 TRIPOD is a large portable tripod to support the MP1 Portable Vertical Antenna and other types of whip antennas. 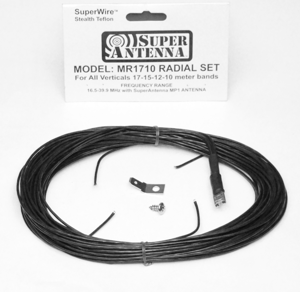 See new Super Antenna products at Ham Radio Outlet.